Bezares SA is pleased to announce the signature of a joint venture with Zhejiang Power Transmission Co., Ltd. establishing a new company named Bezares Power Co. Ltd. The new company was set up after a year of discussions between Bezares SA and Zhejiang Power Transmission Co.,Ltd. who have recognized the major synergies that both companies offer to each other in the field of PTOs, winches, pumps and shaft adapters. Zhejiang Power Transmission Co., Ltd. is a leading hydraulic parts manufacturer based in Yaozhuang– Zhejiang Province – with a facilities of 10.000m2 and with a workforce of 135 people and an anual production of 40.000 PTOs. Bezares Power Co. Ltd. is managed by the current Bezares' headquarters based in Casarrubios del Monte, Toledo, Spain. The establishment of the new company Bezares Power Transmission Co.,Ltd. offers clear advantages for both. The western Bezares' clients will benefit from new PTO models, which are less common in the European market and with a short lead times, keeping the same BZ quality. Besides the Bezares’ and Power’s Asian customers will benefit from the offer increase and the local logistics thanks to the new facilities and thanks to a quality control of European standards. This will represent a new era for Bezares brand in the Asian market. The Zhejiang production plant already has the Bezares' line in production, increasing our offer in 40.000 PTOs a year and with the potential to easily increase up to 50.000 units/year, and has a enviable customer portfolio, turning our well-established European brand into a great power in the Asian market. Zhejiang Power Transmission Co.,Ltd. will be able to draw on the skill, resources and years of developments and refining of a complete range of specialized hydraulic engineering including PTOs, winches, pumps and shaft adapters with the potential to easily increase its production pool extending to the entire Bezares' lineup. Bezares SA is looking forward to offer its new clients the complete range of hydraulic equipment and accessories via the new joint venture company and is also looking forward to developing new relationships with the extended client base. Responding to the market demand and in order to expand our range of PTOs, we have developed a new unit to install on the left side of the Tata G550 gearbox. 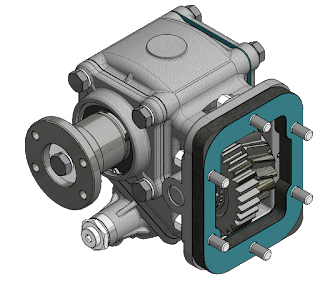 The G550 6-speed gearbox, mounted in the Tata Ultra 1017 vehicles, is produced in a lightweight aluminum-cast, with direct-drive option and driven by cable. This new PTO has pneumatic piston facing downwards to avoid any possible interference with other elements of the vehicle. It is available with flange output as well as with ISO 4 bolts. This power take off is now available under the part numbers 291002 and 291003. Responding to the market demand, we have developed a new two-gear PTO to mount on the left side of the Isuzu MVC-Y6G (6MT) gearbox. This new PTO will be available with output flange SAE and DIN so as with ISO 4 bolts to mount a pump and with vacuum or mechanical shifting. This product will be available in the last quarter of 2017. Following our commitment to quality and to the continuous improvement of our equipment and processes, we have recently acquired the new Gleason 300TWG, which allows the teeth grinding of segmented gears of our ptos and pumps up to module 8. This machine tool has a great performance and it is operated by axes driven by servomotors and components of the highest quality. Its profile grinding capacity and contour dressing offers multiple possibilities of work results in a remarkable reduction of the profiling time, due to its ability to work in several teeth at the same time. In addition, there are also additional functions to improve our parts, as a variable rate method grinding to achieve a better surface texture for quieter gear sets, compensation for the correction of the propeller and many different crowning possibilities. At the hardware level, it includes a complete system of automatic feeding by carousel with pallets and a new system of machine measurement, which allows to increase the productivity and flexibility, controls the stability of the process and even makes corrections without removing the piece from the machine. All this allows a more precise and efficient production, resulting in products of higher quality and more competitive prices.